When I was a kid, we headed back to school after Labor Day. 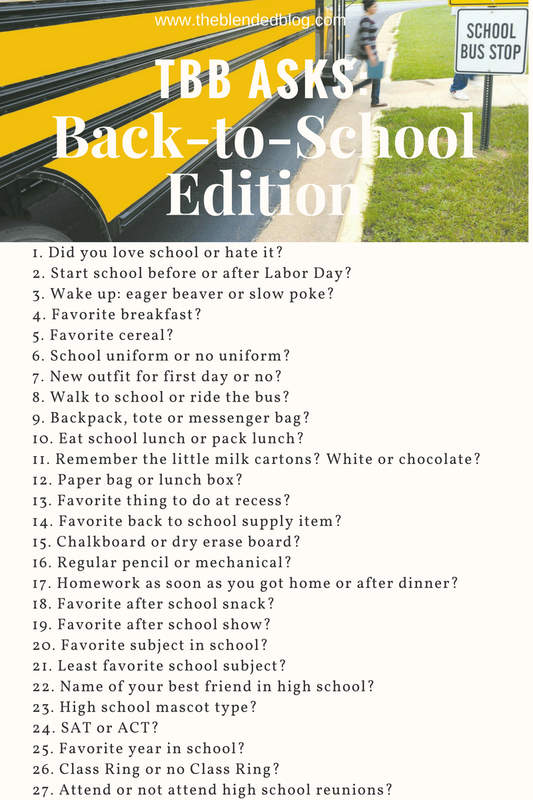 So it’s only fitting that today being Labor Day is the day I’m posting the answers to these TBB Asks Questions – Back To School Edition! 1. Did you love school or hate it? I don’t really remember much before say 6th grade…and that was about when I started hating it. 2. Start school before or after Labor Day? In NJ it was after. Here it is before. 3. Wake up eager beaver or slow poke? I was the slow poke. I used to (and still do) get really hungry before lunch if I just had cereal, so my mom started making me oatmeal. I think I had toast sometimes too. Now I eat an egg. Multi Grain Cheerios…as a kid it was probably Froot Loops! 6. School uniform or no uniform? I didn’t have a uniform, my kids do. Collared shirts in white, maroon, pink, light blue, or navy, plus black, navy, or khaki bottoms. 7. New outfit for first day or no? I’m pretty sure I always had one! My kids had new shirts this year, but just coincidentally because they needed a few new ones. Gabbie also got new shoes. (So did the boys, but Zachary had his since July and Simon’s just came this week). 8. Walk to school or ride the bus? I rode the bus in elementary and high school but in junior high we lived “too close” for a bus (like .2 miles too close – just up the street had a bus but they didn’t let us sneak on to it) so we carpooled. And senior year of high school I drove. I once walked home from high school when I missed the bus and didn’t want to wait for the 2nd bus or for my mom to get back from work and it took 45 minutes. My kids’ school doesn’t have buses and we carpool. 9. Backpack, tote, or messenger bag? Backpack until grad school, I think! Then I had a messenger type bag. My kids have totes in kindergarten and then backpacks. 10. Eat school lunch or pack lunch? I think I did a mix of both, but mostly brought. My kids also mostly bring. 11. Remember the little milk cartons? White or chocolate? I think I was supposed to have white…did I ever have chocolate? Probably! 12. Paper bag or lunch box? I know I had a lunch box in the earlier years and in the later ones I had a cloth lunch bag. My kids have cloth lunch boxes. 13. Favorite thing to do at recess? That totally changed each year! I remember playing a made up game that was a mix of some kind of ball and freeze tag, there was kickball for awhile, then four square, then we had a gymnastics club, then hopscotch. Later it was just hang out and talk! 14. Favorite back to school supply item? I always loved the blank notebooks I got each year! 15. Chalkboard or dry erase board? We had chalkboards way back when. Gabbie’s classes have smart boards! I had never seen those in action before. I like dry erase the best, I think. 16. Regular pencil or mechanical? 17. Homework as soon as you got home or after dinner? I don’t remember. I had some after school activities, so I probably had to do a lot after dinner. My kids do theirs as soon as they get home! 18. Favorite after school snack? The only time I remember eating an after school snack was when I went to my neighbor’s house and they had doughnuts! Zachary eats apples and cheese every day after school, which I think is a good choice. 19. Favorite after school show? I don’t remember watching too much TV after school! My friend (the one with the doughnuts) used to have soap operas on (I think her mom watched them) but I never really cared for them! 20. Favorite subject in school? 21. Least favorite school subject? 22. Name of your best friend in high school? Depends what year…I think mostly it was Swati. 23. High school mascot type? Our mascot was totally weird – the Scottish Highlander. My kids’ is a ram! 25. Favorite year in school? Senior year of high school. Or maybe 4th grade, I liked my teacher and it was before all the drama started. 26. Class ring or no class ring? 27. Attend or not attend high school reunion? Nope. My 20 year reunion was actually last year! Now share with me some of your school memories!